Ok, I’m just gonna say it… Dachshund Puppies are Adorable! Of course adopting one feels like an awesome idea. As long as you do your research first and begin to prepare for the new puppy, you will be all set for their arrival. Bringing home a new dachshund puppy is a lot like bringing home a new baby. Your home and your family need to prepare for the arrival of this special new addition. 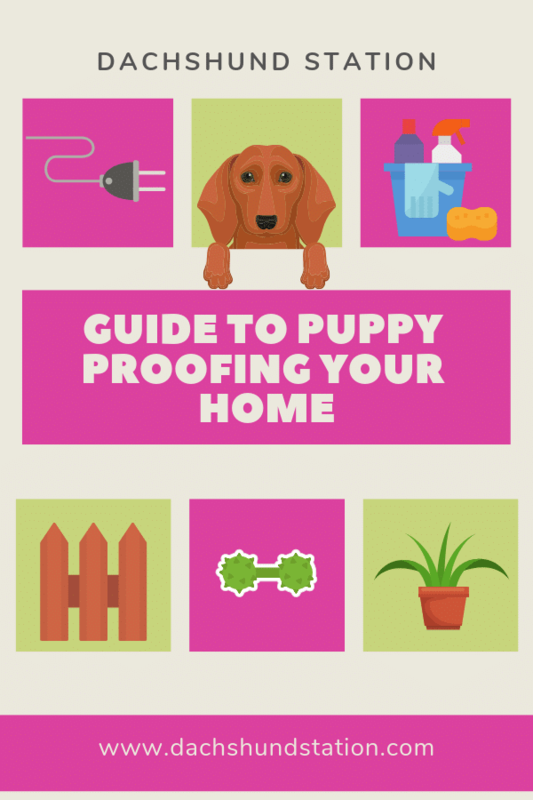 Puppy Proofing your home is a great way to start preparing for your new doxie. Get down on the floor and take a look through your new puppy’s eyes, what can they get into?… because they will. Dachshund Puppy Fact: A newborn dachshund puppy cannot see or hear when they are born. In the first week or two, the puppies eyes and ears start to open up. Hide the Electrical cords and strings. There have been way too many incidents with little puppies chewing dangerous electrical cords or choking on window shade strings. Hide or tape down all your loose cords and strings. Bouncy Balls or small kids toys are objects that can easily be confused with a small dog toy and can be choked on, they all need to be kept away from your new pup. School Supplies like lead pencils, cute colorful erasers are also toxic and attractive choking hazards for dogs. Some pet supply stores sell a foul tasting non-toxic spray that can deter some doxies from chewing the special items you want to protect. If there are rooms in your house where there are way too many things to hide, put up a baby gate in the doorway. Don’t allow them into the garage or the shed where there are a lot of dangerous objects that are hard to avoid. This area should have an easy to clean floor (like tile or vinyl). Take a look at some of the vinyl scraps they have at Home Depot or Lowes, they are usually cheap. Use a baby gate or puppy gate. A baby gate should surround the vinyl or tile floor section for easy clean up in case your puppy has an accident. Keep the designated puppy area away from the walls, cords, or any wooden corners. 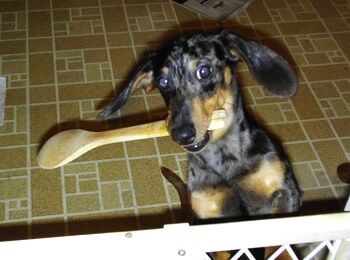 Keep in mind, dachshund puppies love to chew….Everything. This designated puppy area is only temporary while you are in the training and introducing phase. When you are ready, they will be accessing your home next. Put all baking chocolate up high, it is a deadly toxic poison to dogs. Install some child locks on your bathroom or kitchen cleaning product cabinets. 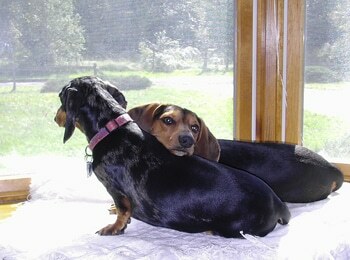 Dachshunds are curious little dogs, they want something, they are determined to get it. Have a heart to heart with your kids about being gentle with the new puppy. Dachshunds have a very fragile back and need to be held a certain way. They also need to avoid being placed up high on couches or beds where they may jump and cause serious injury. Children need to be reminded to treat the puppy with kindness, if the puppy is taunted by anyone, they will adapt to defending themselves in a not so friendly way. Have your child help with feeding and watering the dog. Dachshund Puppy Fact: Puppies live off of their mother’s milk for the first four weeks of life. They can start eating solid puppy food at four weeks old. Avoid feeding your new dog any people food. Feeding your dog table scraps during a meal will quickly become a horrible habit for you and your dog. 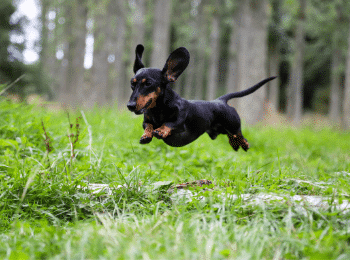 Dachshunds love to bark when they want something, and they have no trouble continuing to bark for a Very Long Time. Avoid giving those table scraps to your dog while you are eating, or you will create a barking machine at every meal you have with your family. Table scraps are also a big no-no in general for your dog. Some dogs have extremely sensitive stomachs, so any table scraps may result in vomiting or diarrhea in the middle of the night. You and your family need to push in your chairs at the dining room table. You may think, well, he is a short little dog, there is no way he will get on the table. Wrongo… these dogs are clever, they will use your chair and anything close to the table to get to the ultimate goal.. your food scraps (or your whole Italian sub… yep, that happened). Secure your garbage can. Dachshunds love sniffing out your garbage in the kitchen and the bathroom. Your garbage will need to be in a place where the dog can’t reach it or has a secure top in case the dog knocks it over. Pick up any kids toys or garden tools laying in your yard. Plants and flowers: Keep your dog leashed up in the yard to avoid taking a bite out of your beautiful gardens. If they roam loose in your yard, consider putting up a small garden fence to keep them away from your plants. 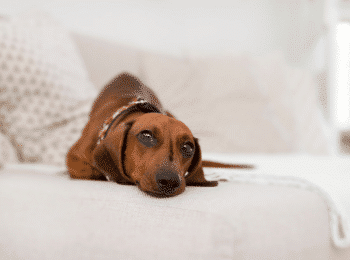 Some plants that are extremely toxic to dachshunds include daffodils, mistletoe, English ivy, holly, nightshade, azalea, and baby’s breath. Always lock up and secure the perimeter of your pool. Some dachshunds love to swim but sometimes can’t determine a safe exit from the water. Remind your dachshund, they are allowed to wear a life jacket and swim with you, but never by themselves. 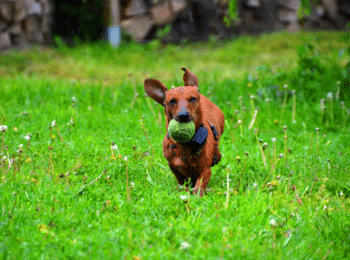 Most fences installed in a yard will be able to keep your dachshund in, but be sure to check the entire fence line to check for holes. If you see a hold, your dachshund will attempt to squeeze out, guaranteed. They could dig under the fence or if it is a wooden fence, they could chew their way through. To avoid the digging under issue, you can line the bottom of the fence with rocks. Choosing the correct kennel is crucial for your dachshund. They will try to get out, so you need to learn how to safely keep them in. Some metal kennels are bendable, so the dachshund’s strong teeth can bend the bars quite easily. The most important features of a kennel that will keep a dachshund safe and secure include a “gorilla tough” locking mechanism on the main kennel door. I have had to add extra clipping locks or carabiners to cheaper kennels when my dog would unlock his door just enough to squeeze out. You want to prevent your dog from trying to squeeze through and getting stuck. So, think of it as trying to keep in a large powerful dog, and that will help you keep your expectations high enough to stay one step ahead of your clever dachshund. Dachshund Puppy Fact: The typical litter size for the dachshund can be three to six puppies. When the puppies are eight weeks of age, they are usually ready to be adopted. Overall, keep an eye on your new puppy, they are curious by nature and want to sniff everything in their new home. Ok, now that you have all of the knowledge on puppy proofing your home, now its time to prepare for the arrival of your new friend. Click “Continue Reading Button” for Preparing your home and family for the new pup.